Discover a simple solution to alleviate the annoying design problem of Kitchen Clutter. In this age of the open plan, live-in kitchen where the kitchen is exposed to other rooms of the house like the family room, it is becoming more popular to disguise the ‘kitcheny’ look of the kitchen in favor of the more comforting look of the adjacent room. We are concealing refrigerators and dishwashers behind decorative cabinet panels and using furniture-like features on the cabinetry to help rid the kitchen of its ‘laboratory’ look. Some people are even bringing pieces of ‘unfitted’ furniture into the mix to help ease the transition between the busiest workroom in the house and its more relaxed neighbor. But there is one menace that is always present in a busy kitchen. Clutter. Clutter can be found along the back edge of most countertops, up against the backsplash. Most of the time clutter just sits there, hogging countertop space while leaving little workspace in front for food preparation. In fact, clutter is the main reason why we think we need so much counterspace to prepare a decent meal. In a kitchen-only kitchen, countertop clutter may not be offensive or objectionable at all. It serves a purpose and we get used to seeing it and having it in our lives. But clutter can destroy the look of a kitchen that is trying to blend into another room. The chaotic look of clutter is generally an unplanned assault to the eye, typically the same eye that chose the cabinetry, appliances and countertops to blend so well together in the first place! Clutter however, should not be mistaken as a form of accessorizing, where everything on display is specifically chosen to create a desired theme. Accessorizing can actually enhance the room blending process, but it is difficult to maintain over time as our daily lives change. On the other hand, real countertop clutter that accumulates over time is so diverse that it is obvious that it is completely unplanned. Clutter can be just about anything that sits on the countertop. Most common are food canisters and condiment containers for salt and pepper, vinegar and oil etc. Clutter can be a basket filled with car keys and notepads, boxes of cereal, an assortment of spices, crockery filled with cooking utensils, or collections of all sorts that show off the owner’s personal conquests at the flea market. But the biggest pieces of clutter are all the small appliances that we need to use so often each day as well as those that we only use occasionally. In period design, where the kitchen design theme tries to emulate a certain historic time period, modern appliances can completely spoil the desired effect. The ‘appliance garage’ nestled between the countertop and the top cabinets has addressed this situation with some success, but in many cases it has just added itself as another form of clutter. 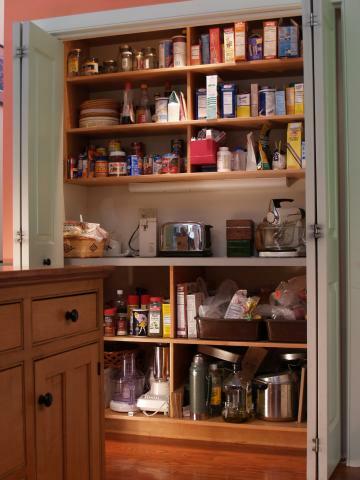 A Working Pantry is simply a modestly sized, two foot deep (or more) countertop that is hidden behind bi-fold doors. Above and below the countertop area is storage in the form of open shelving and/or cabinetry. When the bi-fold doors are open, the countertop can be used to store clutter and can be used as dedicated workspace too. Working pantries can be created in the form of a closet or as full height and depth cabinetry or even as freestanding furniture (similar to a bedroom armoire with a countertop in it.) The least expensive pantries typically are closets with a plastic laminate countertop and exposed shelving hidden by full height bi-fold doors. A walk-in closet style pantry can become a working pantry as opposed to just a storage pantry simply by adding a real worktop. Full-height cabinetry, with bi-fold cabinet doors above the countertop can be retrofitted into most kitchens at the end of a long run of cabinetry. And a freestanding piece of furniture like an armoire/working pantry can truly ease the visual transition between the world of a furnished family room and a utilitarian kitchen. 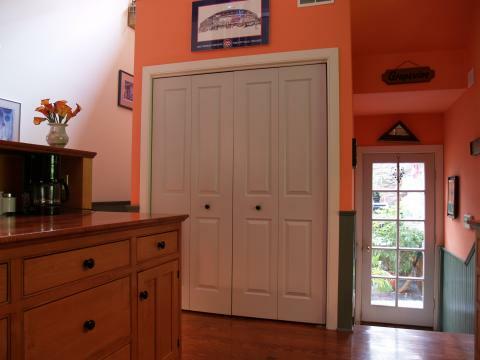 Pocketing flipper style doors can be substituted for bi-fold doors in cabinetry or furniture when it is desirable to keep the doors out of the way when the countertop is exposed. But in all of these configurations, the main feature is that the interiors can be kept neat and orderly or completely chaotic, and with the doors closed, nobody knows the difference. Visual order is restored! 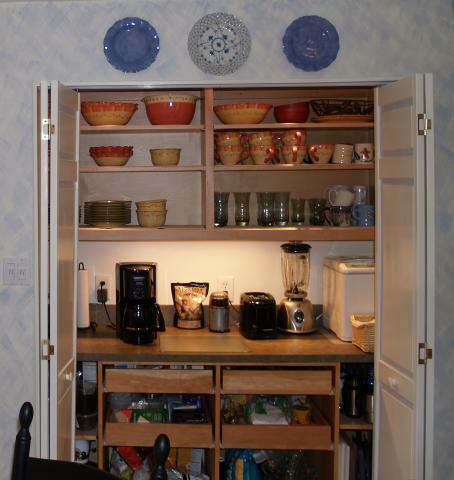 The Working Pantry does a great job hiding clutter while providing extra work space and storage space. But it can also become a dedicated work space to handle specific tasks. For example a baking center can have a marble top and special areas to store the mixer, chopper, baking pans and everything else that’s needed for baking. It can even have bins for flour and sugar built right in, just like the old Hoosier cabinets. Another version can be designed as a wet or dry bar with areas for liquor bottles, a stemware rack, wine bottle rack, a sink and even an undercounter refrigerator. A built-in bar/working pantry can even be used as a partition between two rooms, with bi-fold doors front and back so that the bar can be accessed from either room, but closed off when it is not desirable to be seen from either side. 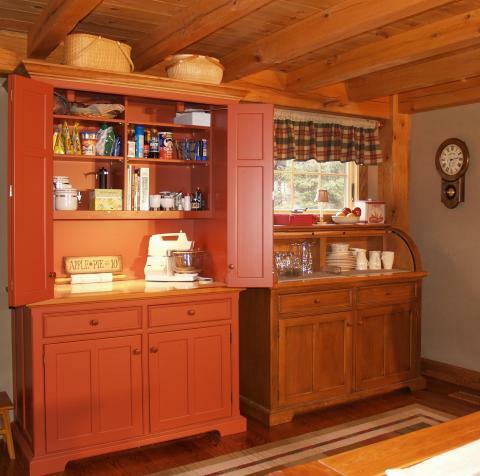 Or it can become a breakfast/snack bar that accommodates the coffee maker(s), toaster and a small microwave along with the breakfast/snack foods and dishes. The breakfast/snack bar is especially nice as a piece of furniture located in the breakfast area/transition space between the kitchen and family room. 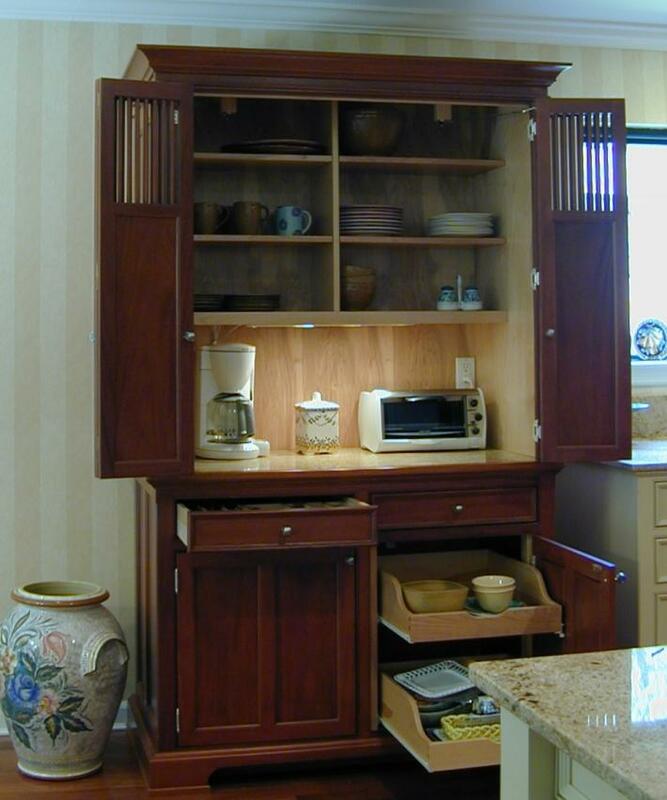 It becomes a hard working alternative to the decorative hutch style cupboard found in many dining areas. More often than not, the simpler the idea, the more successful it can become. A working pantry is one of those simple ideas that just makes sense. Though it is not required in every kitchen, it certainly can simplify the look of most kitchens, especially the ones that we label ‘The Heart of the Home’, the ones that need to blend with an adjacent room and become more than just a kitchen. 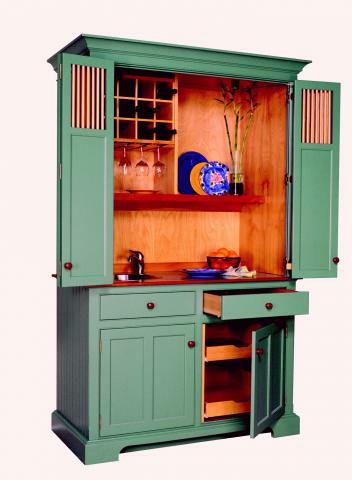 YesterTec’s Working/Bar pantry ( the green one shown below) won Home Magazine’s 6th Annual American Kitchen & Bath Awards as one of the 14 Best New Products of 2004. It was also recognized as the WINNER of the cabinetry category in Woman’s Day Specials Kitchens & Baths Magazine’s First Annual KB Awards for the Best New Products of 2004.